The secret to stopping some viruses from making people sick might be hidden in red wine and chocolate—but that doesn't mean having more bonbons and vino is in order, Kansas State University researchers say. "Resveratrol is a small, natural compound in many plants like grapes, cocoa beans, peanuts and blueberries," said Shuai Cao, postdoctoral researcher studying the effects of resveratrol on viruses. "Our recent study found that high concentrations of resveratrol—higher than anything you may find in food naturally—prevent poxviruses from replicating in human cells." "There are many poxviruses that infect many species and they share similar mechanisms to replicate their DNA," Cao said. "Resveratrol works to inhibit replication in two of them—the vaccinia virus and monkeypox—so it should be able to inhibit other poxviruses as well." "Although smallpox was eradicated, several other poxviruses are still medically relevant," Pant said. 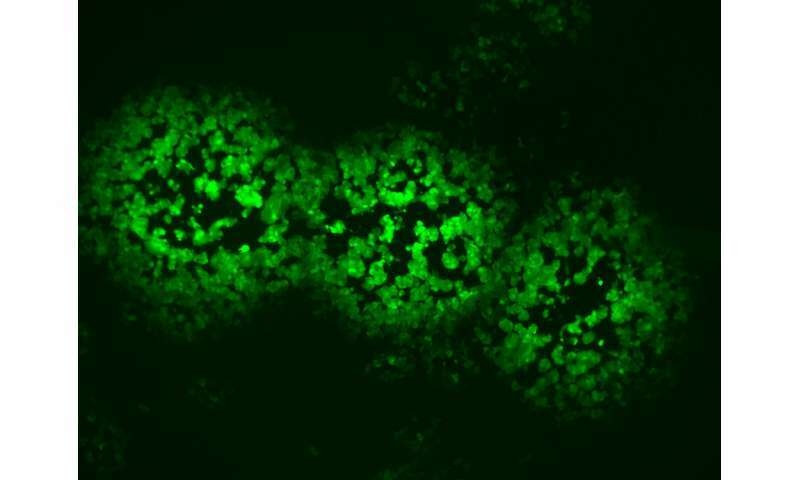 "Many of the viruses can cause significant loss—economic or healthwise—but vaccinia can be used for good such as a gene carrier in gene therapy and cancer treatment."